Electroceutica kunnen helpen om allerlei aandoeningen, zoals tinnitus (oorsuizen) en epilepsie, te bestrijden. Dat zegt prof. Wouter Serdijn in zijn intreerede als hoogleraar bio-elektronica aan de TU Delft op woensdag 30 maart. Electroceutica betreft het slim, lokaal en gericht toedienen van helende elektrische pulsen aan het lichaam. De technische uitdaging is het slimmer en kleiner maken van de apparatuur. Volgens prof. Wouter Serdijn kunnen ‘electroceutica’ uitgroeien tot een nieuw en belangrijk type medicijn, naast en als aanvulling op de al bestaande farmaceutica. Werken farmaceutica op een chemische wijze in op het lichaam, electroceutica doen dit op een elektrische manier. Electroceutica dienen helende elektrische pulsen aan het lichaam toe op een slimme en gerichte wijze, vooral voor aandoeningen die hun oorsprong vinden op specifieke plaatsen, in bijvoorbeeld de hersenen.Het gericht geven van elektrische pulsen kan bij veel aandoeningen helpen, en is zeker niet alleen toepasbaar in de hersenen. Het grote voordeel van de elektrische methode boven farmaceutica is dat het effect lokaal is. Pillen werken immers in op het hele lichaam en veroorzaken derhalve snel bijwerkingen. 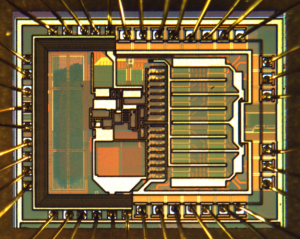 Een chip in zijn meet-behuizing voor het uitlezen van de neurale signalen tijdens en direct na het elektrisch stimuleren, door Cees-Jeroen Bes, in samenwerking met LUMC-KNO. Ondersteund door STW, TMSi, AB-Sys and HealthTech. Concreet is het doel om een flexibel hersenimplantaat te ontwikkelen op een polymeer-substraat. Dat implantaat dient dan als algemeen platform voor diverse typen implantaten. Uiteraard vinden de technische ontwikkelingen plaats in nauwe samenwerking met artsen. Dit komt ook tot uiting in het symposium dat op de dag van de intreerede van Serdijn wordt gehouden. Medical Delta partners ErasmusMC en LUMC zijn goed vertegenwoordigd in het programma. Tijdens het symposium wordt bio-elektronica besproken vanuit een technologisch, een medisch, een klinisch, een industrieel en een maatschappelijk perspectief. Vijf vooraanstaande sprekers van het ErasmusMC, het LUMC, de Dunedin School of Medicine en een biomedisch bedrijf behandelen deze thema’s. Het symposium en de intreerede van prof. Serdijn. De afdeling Bioelectronics van de TU Delft. Informatie over prof. Wouter Serdijn. Wouter Serdijn, prof. bio-elektronica TU Delft, W.A.Serdijn@tudelft.nl, +31 (0)15 278 1715. Claire Hallewas, persvoorlichter TU Delft, c.r.hallewas@tudelft.nl, +31 (0)6 4095 3085. On December first of last year I became the proud father of a baby boy, Wouter. Unfortunately, the pregnancy and birth did not go according to plan and my wife and I were exposed to a long period of hospitalization and a lot of medical devices. It all started October last year when my wife was hospitalized with pre-eclampsia, a form of pregnancy related high blood pressure. The fact is there is no cure or proper treatment for this besides inducing labor and abort the pregnancy. Being only 25 weeks pregnant at the time the survival changes of the baby are already quite good thanks to modern neonatology, but certainly not without complications. Obviously the best path for our unborn child was to extend the pregnancy for as long as possible and try to control the high blood pressure with medication. Two months of intensive hospital care and almost weekly increasing dose of medication followed. The heartbeat of our baby was monitored daily by means of cardiotocography, CTG, to check if he could still handle the high dose of medication. The resulting graphs were, according to the doctors, sub-optimal. 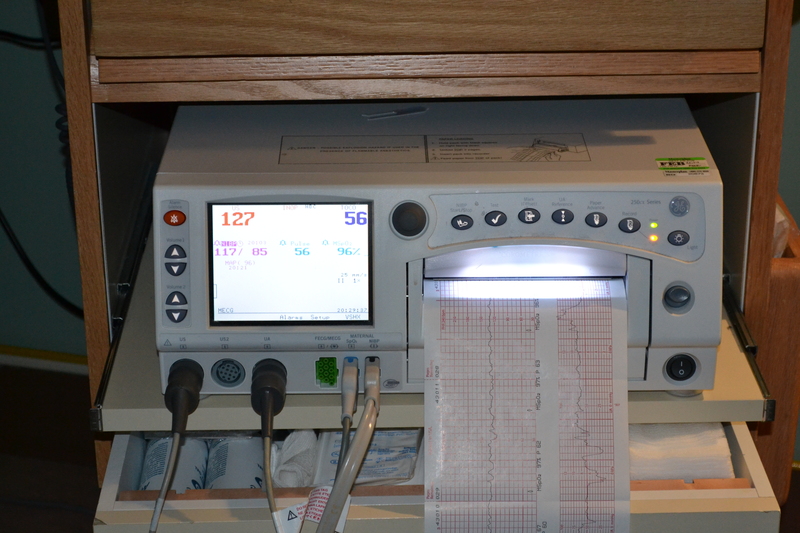 This resulted in the fact that my wife was connected to this CTG machine for up to 4 hours a day before the doctors were confident again that our baby was stable. As a father confident in the strength of our child I soon blamed the machine for this sub-optimal picture. It was not long before we realized that almost all drops in heartbeat correlated with movement of the baby. As an engineer, my hands were itching with the urge to re-write the software of this machine and add an additional graph with signal quality to the output. Weeks of endless CTG and blood pressure medication passed. By the time of the 30st week of pregnancy oral medication was nog longer sufficient and the real heavy stuff was administered through IV drip. Two weeks passed until there was no other option than to abort the pregnancy. Although usually inducing labor is not successful at this early terms my wife managed to pull it off and finally our son was born. Although weighing only 1417g it was a strong guy that could already breath on his own. 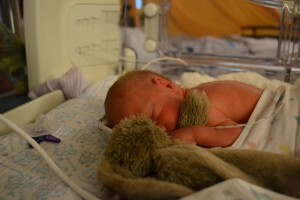 He spent only one night at the intensive care for observation before we could move him to the high-care section. The good news only lasted half a day. After a routine ultrasound of the brains the doctors discovered a massive hemorrhage. His right ventricle was half filled with blood and the left completely filled. At the left side there was already sign of damage to brain tissue. The damage concentrated to the connections from the motor cortex to the central nerve system. The neonatologist explained to us that bleedings at premature born babies are not that uncommon, the strange thing about our case was that the bleeding already occurred before birth. Luckily the human brain, and especially the undeveloped brain of babies, is capable of finding new connections and avoid damaged regions. There is a chance that we won’t be able to notice anything abnormal in the way our baby moves but it was clear that our days of worrying and hospital visits were long from over. But first things first, being only 1417g our boy needed to gain strength in an incubator. The incubator is, again, a collection of medical electronics where the engineer in me would love to make some improvements. Take for example the electrodes used for monitoring the heartbeat and the sensor for measuring blood oxygen saturation. I’m not sure if it was the way of handling our baby but somehow the leads always seemed to be tangled. Small wireless sensors would be very helpful in this situation. Perhaps this is a good use for low power ultra-wide-band technology. On the other hand, it is nice to see the designers already took some effort making the electrodes fit in to the cuddly baby environment by printing cute teddy bear pictures on them. Another one and a half month passed before out baby boy was strong enough to leave the hospital. As a final check an MRI was made. It clearly showed the damaged regions but also that the brains developed normal and that the remaining blood was gradually cleared away. At this point he is just like any other baby. There is nothing wrong with his ability to cry us awake during the night or to kick off his socks. Nevertheless, his development will be closely monitored with perhaps even more electronics. I guess my messages to other biomedical engineers is first of all, keep up the good work. Until you need the electronics we design you don’t really realize how valuable our work is. Secondly, I think it would be helpful to try to evaluate the design from the viewpoint of the patients and medical personnel that are using your products. Article in Maxwell, the quarterly magazine of the Electrotechnische Vereeniging, ETV, Issue 18.4, by Farnaz Nassiri Nia, MSc Student in the Section Bioelectronics on the basic principles of optogenetics and a state-of-the-art bioelectronics application for the treatment of epilepsy. The brain is the mystery of the human body. Neurons, as primary units of the nervous system, are joined together into a complicated biological interconnected network. A conventional method to manipulate the neural performance within this network is to use drugs that alter the chemical balance of the brain. 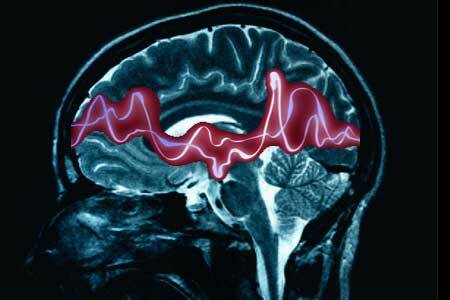 However, a crucial aspect of the nervous systems is the electrical signalling between the neurons. Bioelectronics has advanced the neural modulation techniques beyond the conventional methods by developing electrical brain stimulation tools. Electrical brain stimulation is truly beneficial to understand the mechanism underlying neural behaviour, and develop novel therapeutic methods. Optogenetics is another breakthrough method in neural stimulation techniques, which has opened up entirely new avenues of research opportunities in the fields of neuroscience and bioelectronics. In this article, the basic principles of optogenetics and a state-of-the-art bioelectronics application for the treatment of epilepsy are described. 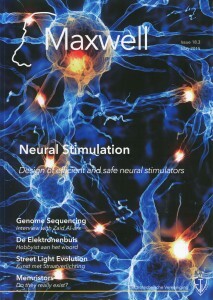 Article by Marijn van Dongen, honorary aluminus of the Bioelectronics Group, in Maxwell 18.3, the quarterly magazine of the Electrotechnische Vereeniging, on the work he did for his PhD studies on power efficient and safe neurostimulation. 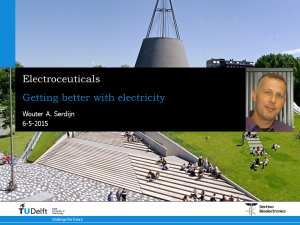 On May 6, 2015, Collegerama of TU Delft made video recordings of the lecture I gave on Electroceuticals. Electroceuticals are the electronic counterparts of pharmaceuticals and are miniature electronic devices that interact with the body in an electrical fashion. In this talk I discuss: neurostimulation and the need to make neurostimulators smaller, more power efficient and more intelligent; optogenetic neuromodulation and the need to make this new neuromodulation modality operate in a closed-loop fashion; neurosensing devices to make neurostimulators intelligent and thereby adjust themselves to the therapeutical needs of the patient; autonomous wireless sensor nodes that can measure temperature or the electrocardiogram without the need for a battery; an outlook into the future of electroceuticals with the promise to treat a larger variety of neurological and brain disorders better. Hersenstimulatie wordt tegenwoordig succesvol toegepast ter bestrijding van ziektes als Parkinson, chronische depressie, pijn en tinnitus. Door neurostimulatoren energiezuiniger en kleiner te maken, kunnen ze doelgerichter en voor een groter scala aan hersen- en zenuwaandoeningen worden ingezet. Marijn van Dongen maakte een prototype van een chip waarmee deze vorm van neurostimulatie kan worden toegepast. Hij promoveert op vrijdag 24 april op dit onderwerp aan de TU Delft. Hersenstimulatie wordt tegenwoordig succesvol toegepast ter bestrijding van ziektes zoals Parkinson, chronische depressie, pijn en tinnitus en er zijn aanwijzingen dat hersenstimulatie ook succesvol kan zijn in de behandelingen van nog veel meer hersenaandoeningen, zoals epilepsie, verslavingen, migraine en dementie. Veel bestaande neuro-stimulatoren hebben echter een beperkte energie-efficiëntie, waardoor een grote batterij nodig is. Een grote batterij maakt de hele neurostimulator groot waardoor deze niet op de plaats geïmplanteerd kan worden waar de stimulatie ook daadwerkelijk nodig is. Vaak verbinden onderhuidse draden de neurostimulator in de borst met de elektroden in de hersenen. Daarom is aan de TU Delft een nieuwe manier van neurostimulatie onderzocht: hoog-frequente (HF) neurostimulatie. De doelmatigheid van deze HF-stimulatie in aangetoond via simulaties en met in-vitro-metingen (in samenwerking met de afdeling Neurowetenschappen van het Erasmus Medisch Centrum). HF-stimulatie heeft hetzelfde effect op weefsel als klassieke stimulatie, alleen kan HF-stimulatie energiezuiniger zijn. De batterij kan daarmee kleiner worden en er zijn minder ruimte-verslindende componenten nodig. Er is een prototype chip ontwikkeld waarmee deze vorm van neurostimulatie kan worden toegepast. In samenwerking met neurowetenschappers van het Erasmus Universitair Medisch Centrum, de University of Texas at Dallas (VS) en de University of Otago (Nieuw-Zeeland) is de methode succesvol geverifieerd. Voorafgaand aan de promotie van Marijn van Dongen is er een colloquium over neurostimulatie door prof. Dirk De Ridder: the future of brain, spine and nerve stimulation. Prof.dr. Dirk De Ridder bekleedt de Neurological Foundation Chair in Neurosurgery aan de Dunedin School of Medicine, University of Otago, Nieuw-Zeeland (vrijdag 24 april, 10.00-11.15 uur; Snijderszaal: EWI-LB01.010, TU Delft). “It’s all in your head—those icky feelings, all that fog—and chemicals just aren’t that great at cutting through. That’s why scientists are experimenting with changing the brain game by tweaking its circuitry, rather than the chemical processes. 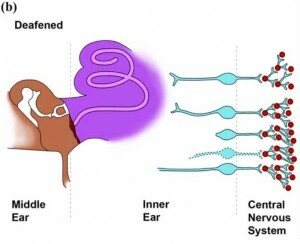 Damaged situation of the middle and inner ear; hair cells are damaged or non-existent, nerve cells are not fully developed or do not reach the cochlea . In this essay, by Ide Swager, MSc student in bioelectronics, an overview of current and future developments in implantable hearing devices is presented. It has been written as part of the course Introduction to Microelectronics for the M.Sc. 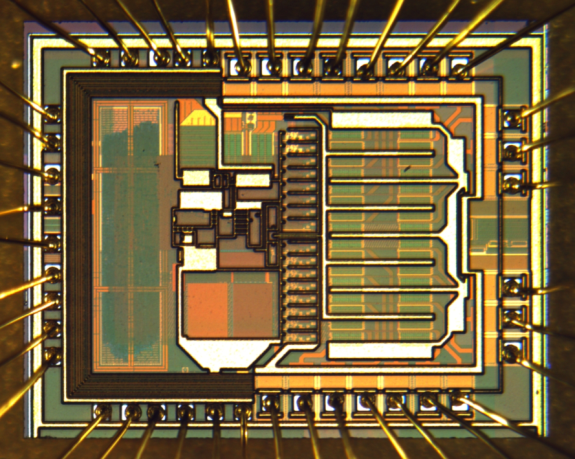 track Microelectronics of the faculty Electrical Engineering, Mathematics and Computer Science of Delft University of Technology. A brief version of the auditory anatomy is included to clarify the causes of deafness. After elaborating on the current devices available and the basic working principle, future trends are explored. These include Neural Response Telemetry (NRT), combined Acoustic and Electric Stimulation (EAS) and binaural devices. Cerebellar output controls generalized spike-and-wave discharge occurrence. Kros L, Eelkman Rooda OH, Spanke JK, Alva P, van Dongen MN, Karapatis A, Tolner EA, Strydis C, Davey N, Winkelman BH, Negrello M, Serdijn WA, Steuber V, van den Maagdenberg AM, De Zeeuw CI, Hoebeek FE. Disrupting thalamocortical activity patterns has proven to be a promising approach to stop generalized spike-and-wave discharges (GSWDs) characteristic of absence seizures. Here, we investigated to what extent modulation of neuronal firing in cerebellar nuclei (CN), which are anatomically in an advantageous position to disrupt cortical oscillations through their innervation of a wide variety of thalamic nuclei, is effective in controlling absence seizures. Two unrelated mouse models of generalized absence seizures were used; the natural mutant tottering, which is characterized by a missense mutation in Cacna1a, and inbred C3H/HeOuJ. While simultaneously recording single CN neuron activity and electrocorticogram (ECoG) in awake animals, we investigated to what extent pharmacologically increased or decreased CN neuron activity could modulate GSWD occurrence and short-lasting on-demand CN stimulation could disrupt epileptic seizures. We found that a subset of CN neurons shows phase-locked oscillatory firing during GSWDs and that manipulating this activity modulates GSWD occurrence. Inhibiting CN neuron action potential firing by local application of the GABAA -agonist muscimol increased GSWD occurrence up to 37-fold, whereas increasing the frequency and regularity of CN neuron firing with the use of gabazine decimated its occurrence. A single short-lasting (30-300 ms) optogenetic stimulation of CN neuron activity abruptly stopped GSWDs, even when applied unilaterally. Using a closed-loop system GSWDs were detected and stopped within 500 ms.
CN neurons are potent modulators of pathological oscillations in thalamocortical network activity during absence seizures and their potential therapeutic benefit for controlling other types of generalized epilepsies should be evaluated. © 2015 American Neurological Association.